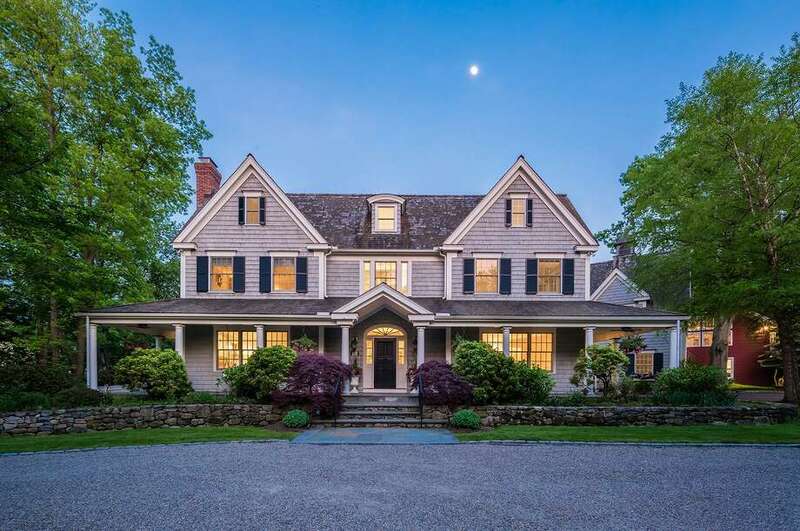 The gray colonial house at 369 Sasco Hill Road features 11 rooms, a carriage house, a covered wrap-around front porch, and a wealth of entertainment features in the backyard. FAIRFIELD — Eighteen years ago a large property on prestigious Sasco Hill Road was subdivided into three parcels. Fairfield-based general contractors, Tallman Building Company, constructed a house on each of those parcels, the third of which, at 369 Sasco Hill Road, included the original property’s 19th century carriage house. The carriage house dates back to 1890 and is just the first of many attractive features found on this two-acre property, which is on the market for the first time since the house was built in 2000. The house is set well back from the road ensuring its privacy. To access it travel from Sasco Hill Road down a long driveway, passed stone pillars topped with lanterns to the crushed stone circular driveway lined in Belgium block. In the landscaped circlet in front of the gray shingle house there is a man-made pond with a soothing trickle of water. A much larger body of water is found in the backyard. The heated Gunite in-ground, free-form swimming pool is joined by a poolside spa, separate hot tub, stone patio, fire pit, two wisteria-covered pergolas, and retractable awnings to create a private oasis and ideal entertainment space. This beautiful yard feels miles away from civilization and yet the Post Road (Route 1) is only minutes away, and so is Southport Village, Southport Harbor, Southport Beach, and the Southport Metro North train station. The backyard is not the only place to sit and relax. This 5,934-square-foot house features a large, covered, colonnaded wrap-around front and side porch. The front door is framed by sidelights and a decorative fanlight transom and it opens into the foyer where there is a gracefully curved staircase with a decorative newel post, powder room, and trendy paint on the walls in a metallic silver. To the left is the formal living room, which has a marble fireplace and window seat, and to the right is the formal dining room. Entranceways into both rooms feature interior transoms. Both are also separated from the foyer by French doors. The metallic silver of the foyer walls is repeated in the tray ceiling of the dining room, which also has wainscoting on the lower walls and a café-style door into the butler’s pantry. That pantry has a wine refrigerator and built-in wine rack above the glass-front cabinets. Also accessed from the foyer is the cavernous great room, which includes the gourmet kitchen, family room, and breakfast nook. Among the kitchen’s features are a sizable center island with a Calacatta Gold marble counter and a breakfast bar for four stools, another dark marble on the perimeter counters, and large farm sink. High-end appliances include a Sub-Zero refrigerator and Thermador Professional six-burner range with grill and double ovens. French doors in the breakfast nook open to the patio and yard. The family room has a floor-to-ceiling stone fireplace, ceiling fan, and a door to the screened porch. Off the family room there is a den with a floor-to-ceiling red brick fireplace, slate floor, French doors into the screened porch, and sliding doors to the patio and yard. The office has built-in shelving and French doors to the screened porch. It also has an alcove with two built-in desk areas. On the other side of the kitchen the mudroom has door to the front and backyards, a large walk-in closet, half bath, and access to the attached three-car garage. The car enthusiast should know that there are four additional bays in the carriage house. On the second floor of the charming carriage house there is living space including a kitchenette, bedroom, full bath, a large living room with a fireplace, and a loft. This could be a guest house, or in-law or au pair apartment, or a home office. It currently serves as an art studio. On the second floor of the main house, there are four bedrooms; two are en suite and two share a Jack-and-Jill-style bath. The spacious master suite features two walk-in closets - one with a dressing room, and a marble bath with a jetted tub, marble mosaic tile floor, shower, and long double vanity. The full partially finished basement has an exercise room with a mirrored wall. For more information or to set up an appointment to see the house contact the team of On the Harbor of Al Filippone Associates/William Raveis Real Estate (Libby McKinney-Tritschler, Andrew Whiteley and Wendy Ryan) at 203-964-7450 or ontheharbor@afahomes.com.